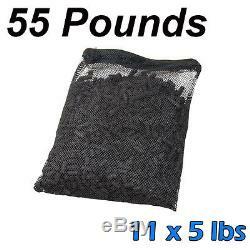 55 lbs Activated Carbon in 11 Media Bags for aquarium fish koi pond filter. Activated carbon uses a process called chemical filtration which removes dissolved organics from your water garden. These organics can make the water yellow in color. Activated Carbon will remove colors, odors, medications and other impurities to help make your pond water clearer. It is recommended to use carbon on a intermittent basis. Pond carbon needs to be placed in a mesh bag to contain it. Once the pond carbon is in a bag, it can then be placed in an area of high water flow. Some recommended areas include: underneath a waterfall, inside a up flow waterfall filter, falls filter, canister pressure pond filter or other types of pond filters. 55 lbs carbon treat up to 2000 gallon pond. INCLUDES: Total 55 lbs active carbon in 11 mesh media bags, 5 lb active carbon in each mesh media bag. Sometime you need wait 24 hours to see the real tracking info. Electrical Devices must be in its orginal packaging with all included paperwork. Fish Foods must be unused and sealed. We do require a return authorization number. Do not write anything on the box, please write on separate paper. QPOND is committed to honor and respect all of our customer's individual information and privacy. The information you provide will be secure and protected to provide you a safe and great shopping experience. Your mailing address information will never be provided to any other company for marketing or use. It is strictly for QPOND use only. Listing and template services provided by inkFrog. The item "55 lbs Activated Carbon in 11 Media Bags for aquarium fish koi pond filter" is in sale since Monday, March 18, 2013. This item is in the category "Pet Supplies\Fish & Aquariums\Filters". The seller is "lotuspond2010" and is located in Hacienda Heights, California. This item can be shipped to United States, Canada, United Kingdom, Denmark, Romania, Slovakia, Bulgaria, Czech republic, Finland, Hungary, Latvia, Lithuania, Malta, Estonia, Australia, Greece, Portugal, Cyprus, Slovenia, Japan, China, Sweden, South Korea, Indonesia, Taiwan, South africa, Thailand, Belgium, France, Hong Kong, Ireland, Netherlands, Poland, Spain, Italy, Germany, Austria, Israel, Mexico, New Zealand, Philippines, Singapore, Switzerland, Norway, Saudi arabia, Ukraine, United arab emirates, Qatar, Kuwait, Bahrain, Croatia, Malaysia, Brazil, Chile, Colombia, Costa rica, Dominican republic, Panama, Trinidad and tobago, Guatemala, El salvador, Honduras, Jamaica.